THE community of Ballymurphy and the wider Carlow area turned out in force to generously support a memorial walk and run in memory of the late Ann Marie Murphy (née Ralph). 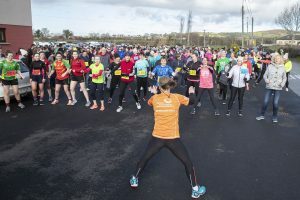 Around 800 people took part in the 5km and 10km walk and run in Ballymurphy, with proceeds going to Cancer Care West, which provided great care to Ann Marie. “Cancer Care West looked after Anne Marie so well when she was sick; I just wanted to give something back to them,” said Ann Marie’s sister Theresa, who instigated the event. A final tally of the monies raised is not yet known, with funds still coming in, but a fantastic figure exceeding €17,000 has already been generated. Ann Marie passed away in September, aged 31, having been diagnosed with cancer earlier in the year. Originally from Kyle, Ballymurphy, Ann Marie played camogie at all levels with Mount Leinster Rangers as well as representing Carlow at county level. Married to Andy Murphy, Ann Marie had settled in Oranmore, Co Galway, where she worked as a teacher in Ballinrobe, Co Mayo. Andy joined Ann Marie’s family, parents Mary and Seán, brother Michael and Theresa at the event. It’s hoped the memorial walk and run will now become an annual occasion. Theresa expressed the family’s heartfelt gratitude to everyone who supported the memorial walk and run, from those who provided delicious baked goods to walkers and runners who took part.